A quick article on the option of standing outside your goal to prepare for the corner. Not everyone uses it and might consider this sort of thinking to be a little tedious, but I think to think outside the box and enjoy writing about all things goalkeeping, so something to mull over if you’ve never considered it before! ‘Time wasting’ at the corner is essentially just taking your time to set up at the short corner, stepping outside of goal and making the most of the opportunity to prepare or attempt to ‘psych out’ the opposition. I thought I’d give it that title just to reel you in (hopefully!)! It’s basically an opportunity to take on fluids and rehydrate (if you are playing in a hot climate especially, or to help with mentality and concentration; water is said to aid this!) as well as organise your corner defence, especially if the opposition are running a set-up you are having trouble with or not experienced before and need to know how to run your defenders against the injection. It’s not exactly the same time wasting in footie where they drag out a spot kick but I guess is in a similar vein. 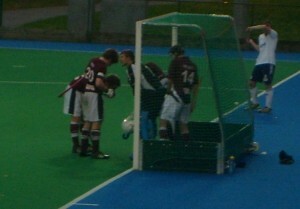 Kelburne take their time preparing for the corner. ‘Time wasting’ at the corner is a variety of things, but I wanted to extrapolate it for the point of article writing! It can be really trying to push the boat out and run down the clock, or simply standing outside the goal and chatting to your defence to organise it, if the team has started to variant their routine and you need to change up your defence run out. Taking the chance to rehydrate and run through options with your team mates. 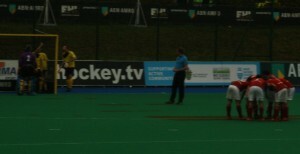 In some ways, in its truest form, ‘time wasting’ is a technique used noticeably at the international level to try and slow down the taking of the penalty corner. Especially if trying to run down the clock at the end of a match when you don’t want to face another corner! The method puts the other team off their efforts in organising the corner attack; hopefully messing up their chances. Defenders will take their time putting on their face masks and try to prolong it for as long as possible. As a team effort, the goalkeeper is also expected to find ways of wasting crucial time! It’s not that uncommon to see goalkeepers step out of their goal just before they set up before a short corner that has been conceded. If you watched the Olympics or been watching other games at international level, then you may have seen various goalkeepers do this. James Fair for example would often drink and talk to his defenders just before getting back into goal to prepare for the corner. I managed to get down to the Euro Hockey League first round stages at East Grinstead not so longer ago in person and watched Kelburne’s goalkeeper in the game against Rot˗Weiss Kӧln taking time out to step out of his goal to do so. You can often find goalkeepers at all sorts of levels doing so too. Instead of stepping into their goal to get ready for the corner, some keepers like to step out of their goal and stand off the line, outside of goal. This allows the team to get organised and signals to the umpire that the time is not ready yet. This is especially useful if you do not have the full 4 defenders for the corner defence and are waiting for the extra men to come back. Once the extra defender has turned up, or your team have got ready, you can step back into goal and get prepared (ready in your stance) for the injection and the shot. 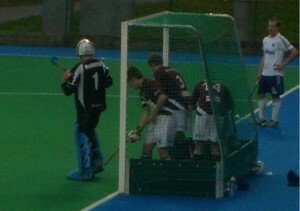 McGregor waits outside his goal. Some goalkeepers will even go as far as stretching to try and run down the clock even further. When they are outside of the goal, waiting for their teammates to get organised (if the defenders are putting on their face masks, jocks and hand protection) then the goalkeeper could do some stretching, like the leg muscles. If you wanted to waste further time, you could pretend there was something wrong with your equipment. For example, you could fiddle with the straps on your kickers, or take a leg guard off to look at the kicker and then put it back on again (pretending as if there’s something wrong with it). Doing this wastes further time and frustrates your opponents even more. This goalkeeper almost ‘takes liberties’ with his stretching! N.B. : In writing this, I’d like to point out I don’t condone it, as reporting it, just making note of observations from games I’ve made! It feels a little cheeky and audacious to try to get away with! ‘Time wasting’ other than the phrase, at its simplest form; of stepping out of goal and organising offers a simple but crucial option. It gives you the time to think through options against an opposition who are trying a different corner routine, which you need to analyse and work out a suitable way to defend. If you have faced a corner where the opposition have ‘switched things up’ and changed their approach then your standard defence may not be up to it. Ex-GB and Scotland international Ali McGregor used to talk with his defenders outside the goal to talk through things with his defenders in club action when he was at Loughborough as do various other goalkeepers. 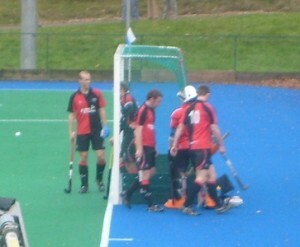 McGregor discusses with his team mates how the short corner defence will be organised. It also gives time to rehydrate as has been stated previously. Rehydrating is important and often forgotten and the umpire should allow you to get a drink during the process of preparing for the corner, within the team it takes your defenders to put on extra protection. Otherwise you may be taking the risk in getting a drink, only to have to push your helmet on and rush out of goal as someone throws an aerial into your D or something, as I’ve heard a tale of! Rob Turner of Bowdon takes on some water. Whilst, the title and phrasing suggests that you could actually time waste, I don’t think umpires should or would seriously let you get away with total defrauding! Umpires will normally time at the elite level to make sure they don’t actually waste time, and hope this is the same for elsewhere. In the Euro Hockey League they had an allotted time limit for how long the team had to prepare on a corner. At lower levels you will still get astute umpires making sure you’re not taking an obscene amount of time with the tactic, even if the same restrictions aren’t in place (i.e. amount of time set)! One other interpretation is that it is to do with ‘mind games’ a goalkeeper can play with the opposition. Just like at flicks where a goalkeeper might take off their kit and then put it back on again before setting on the line, or banging the posts and making a lot of noise, that sort of thing! The idea is to put the team off their attack. It is a simple concept: the more time you waste, the more agitated and annoyed the opposition get; putting them off their ‘game’. Rather than allowing them to get on with it, they will probably get annoyed at the idea of you running down the clock! By doing this, you ‘get into the heads’ of the opposite team; playing mental games like this will disrupt their concentration and therefore disrupt the corner routine, getting them to hopefully miss. If they have a set routine they like to use, then they may end up changing it, or the drag flicker could mess up, having had his concentration dented. But, at the end of the day, if like all the posturing done at penalty flicks (like the penalty shootout in football; and there are some bizarre routines!) and you don’t make the save then it’s better just to set and get ready and ensure you do make the stop! Ultimately, it’s up to you to decide how you play. There’s nothing wrong with experimenting and trying things out to work out how you play best and develop your own style. There are a lot of things you can learn about goalkeeping that you won’t pick up from coaching, but rather normally from seeing other goalkeepers play and how they approach the game and this is one of many of them. I personally would rather just set up behind the line, focus on the ball at the injection and try and analyse the corner set-up to expect what type of shot is heading my way, but have sometimes done it in the case of team mates needing a ‘breather’ after a tough half or feel the need to talk through a defensive change.